The band are hyped and ready to rock Green Point Cape Town tonight. We are really excited about the new album and tonight we look forward to giving our fans a taste of it. The album will be launched in August so make sure you don’t miss out on hearing a few of the tracks tonight. 9pm Rhapsody”s Green Point. Don’t miss this opportunity to experience the band’s first public live show in Gauteng of 2012 at TANZ CAFE, and the chance to hear a collection of the brand new songs along with all their radio hits that everyone has come to know and love. Like all truly world-beating bands, MACSTANLEY (formerly FLAT STANLEY) is greater than the sum of its parts. It started with the simple beginnings of big dreams, two chance meetings and a humble song-writing competition in Cape Town, and has grown to encompass sold-out shows across South Africa and Europe; pioneering work with a full orchestra; radio hits and a growing global fan-base. Throughout it all, Andy Mac, Clinton and Neil have upheld an unflagging commitment to giving their audiences songs that make music live beyond the stage-show, the album or the download. It’s a journey that’s taken them from club stages to stadiums and led to their greatest venture yet, a soon-to-be-released brand new 12 track album produced by Brian O’Shea and co-produced and engineered by Chris Tuck. “Lucid, Alive & Dreaming” is the new MACSTANLEY album and it marks their finest work to date – a collection of music that ramps up the sound of the band into a contemporary gear while retaining the signature elements that have brought this pop-rock powerhouse to where it is today. 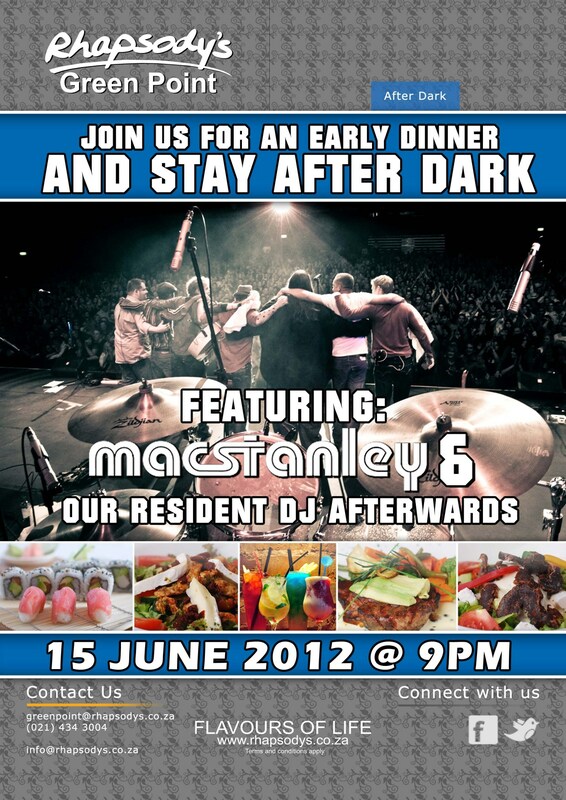 MACSTANLEY have shared stages with Counting Crows, Collective Soul and Metallica, to name a few; graced stages like the Coca-Cola “Massive Mix”, Levi’s “Rage For the Revolution”, Joburg Day and their own immaculately presented theatre-stage music nights. They’ve enjoyed massive airplay and several Top 10 singles on major radio stations across SA and Europe. With their last release, “Between 2wo Worlds” (2007) receiving a South African Music Award nomination, all eyes – and ears – are on this new album. Tickets flying fast for Johannesburg and Cape Town Heineken(R) Symphonic Rocks 2011 events. 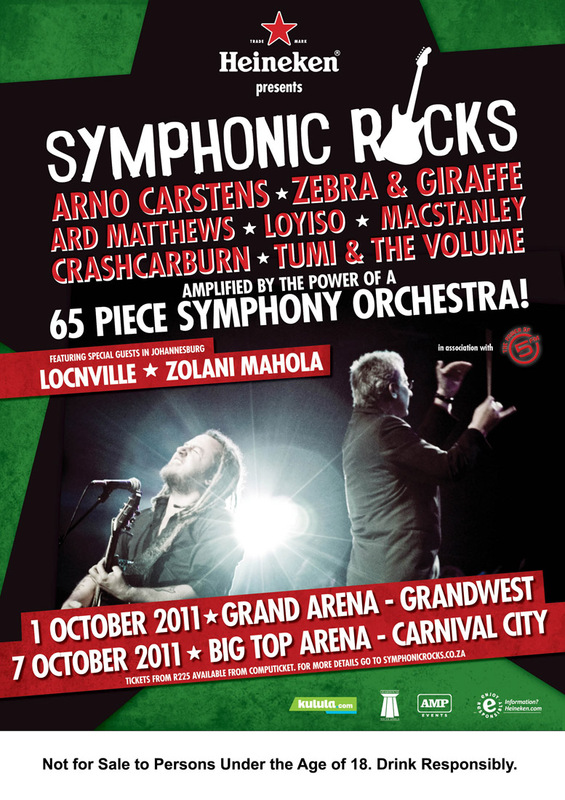 Tickets to the second iteration of Symphonic Rocks, which this year boasts performances in both Johannesburg and Cape Town, are in high demand.This should see artists such as Zebra and Giraffe, Crash Car Burn, Arno Carstens, Loyiso, Tumi and the Volume and MACSTANLEY performing with the support of a full symphony orchestra to capacity crowds at Grand West Arena West Casino in Cape Town and The Big Top Arena at Carnival City in Johannesburg.Presented by Heineken® in association with 5FM, this year’s line-up will feature a mixture of some of South Africa’s most popular artists representing a variety of genres including R&B, Rock and Pop. Additional performers include 2010 bestselling twin brothers Locnville and Zolani Mahola of Freshlyground for the Johannesburg event. According to Andy Mac, who is also the frontman for well-known Pop/Rock Cape Town outfit MACSTANLEY (formerly Flat Stanley), organisation running up to the event has been going smoothly and early ticket sales suggest that Heineken® Symphonic Rocks 2011 is set to build upon the success of Symphonic Rocks 2010. Mac added that the orchestral arrangements and logistics behind the event are also going according to plan. With regards to sales, Mac added that “tickets are selling really well – our advice is not to put off your purchase until the last minute to avoid disappointment”. The unique match up of chart-topping South African artists and a full symphony orchestra, set against the backdrop of an impressive lighting arrangement with an ice cold Heineken® just an arm’s length away has all the makings of the musical highlight of the year. · Tickets cost R225 in Cape Town and R225, R250 and R275 in Johannesburg at Computicket. Capacity at each of the venues is limited so fans are advised to book in advance. · Go to www.symphonicrocks.co.za for more. Not for Sale to Persons Under the Age of 18. Enjoy Responsibly.